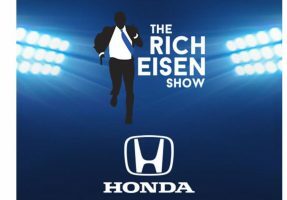 Honda wants to send you on a Trip to Hang with Rich Eisen! One (1) winner will receive a trip for the winner and one (1) eligible guest to Canton, OH for the 2019 Hall of Fame Enshrinement Week scheduled to take place from Thursday, August 1, 2019 to Sunday, August 4, 2019. Approximate Retail Value (“ARV”) of Grand Prize trip package: $4,500. Trip for two (2) to Canton, OH for the 2019 Hall of Fame Enshrinement Week, including domestic roundtrip airfare for winner and one (1) eligible guest between a major metropolitan airport near prize winner’s primary residence (in the event of any dispute, airport shall be determined by Sponsor in its sole discretion) to destination airport for Canton, OH.